Please read carefully and completely the terms of the agreement which follows. 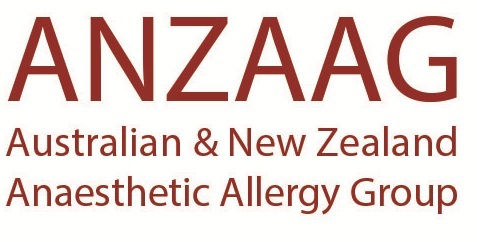 By accessing the Australian and New Zealand Anaesthetic Allergy Group Incorporated (ANZAAG) website, you agree to be bound by the terms of this agreement. If you do not wish to be bound to the terms of this agreement, you must not access the site. 1. Accuracy: Every effort is made to provide information that is accurate. However, information contained in this website is subject to change at any time by appropriate action of ANZAAG. We give no assurance or warranty that information on this site is current and take no responsibility for matters arising from changed circumstances or other information or material which may affect the accuracy or currency of information on this site. 2. Copyright: The website is owned and operated by the Australian and New Zealand Anaesthetic Allergy Group. Copyright to the materials included in this website rests with the ANZAAG unless otherwise stated. All materials, texts, logos and graphics on the site are copyright of ANZAAG or are reproduced with the permission of the copyright owner. You may download, store in a cache, display, print and reproduce the material in the unaltered form only for your personal non-commercial use or use within your organisation. You may not deal with the material in a manner that might mislead or deceive any person. 4. No medical advice: The information posted on this website should not be considered medical advice and is not intended to replace consultation with a qualified medical professional. We do not answer specific medical questions. 5. Disclaimer: Provision of information on this site is for educational and research purposes only. The material is general in nature. It is made available on the understanding that ANZAAG is not thereby engaged in rendering professional advice. Before relying on the material in any important matter, users should carefully evaluate its accuracy, currency, completeness and relevance for their purposes, and should obtain any appropriate professional advice relevant to their particular circumstances. In some cases the material may incorporate or summarise views, guidelines or recommendations of third parties. Such material is assembled in good faith, but does not necessarily indicate a commitment to a particular course of action. Links to other web sites are inserted for convenience and do not constitute endorsement of material at those sites, or any associated organisation, product or service. 6. Referrals: Referrals of patients can be performed by medical practitioners only. Patient referrals must not be directed to ANZAAG or to any of the ANZAAG email addresses listed on the website for administration purposes. Referrals may only be sent to, and accepted by an individual testing centre. The referring clinician is responsible for initial patient treatment, provision of adequate referral information to the chosen testing centre and ensuring the referral is received. All steps must be taken to comply with relevant patient privacy information in this process. 7. Testing Centres: The list of testing centres is provided by ANZAAG as information only to assist clinicians where referral of patients for investigation or specific clinical advice is sought. This does not imply accreditation or endorsement of any individual testing centre by ANZAAG. The ultimate judgement and implementation with regard to a particular treatment plan is at all times the responsibility of the treating clinicians in consultation with a particular patient and will take into account the clinical data presented and the diagnostic and treatment options available. 8. No warranties : This website is provided on an "as is", "as available" basis without warranties of any kind, express or implied, including, but not limited to those of title, merchantability, fitness for a particular purpose or non-infringement or any warranty arising from a course of dealing, usage, or trade practice. No oral advice or written information provided shall create a warranty; nor shall members or visitors to the site rely on such information or advice. This publication is not intended to be a contract, explicit or implied and ANZAAG reserves the right to make changes in the information contained. 9. Liability: The user assumes all responsibility and risk for the use of this website. Under no circumstances shall anyone involved in creating or maintaining this website be liable for any direct, indirect, incidental, special or consequential damages or lost profits that result from the use or inability to use the website and/or any other websites which are linked to this site. We accept no liability or responsibility to any person as a consequence of any reliance upon the information contained in this site. Nor shall they be liable for any such damages including, but not limited to reliance by a member or visitor on any information obtained via the web site; or that result from mistakes, omissions, interruptions, deletion of files, viruses, errors, defects, or any failure of performance, communications failure, theft, destruction or unauthorised access. Users are encouraged to take appropriate and adequate precautions to ensure that whatever is selected from this site is free of viruses or other contamination that may interfere with or damage the user’s computer system software or data. Where states or Countries do not allow some or all of the above limitations of liability, liability shall be limited to the greatest extent allowed by law. 10. Online conduct : Visitors agree to use the website only for lawful purposes and are prohibited from posting on the website any unlawful, harmful, threatening, abusive, harassing, defamatory or obscene material of any kind, including, but not limited to, any material which encourages conduct that would constitute a criminal offence, give rise to civil liability or otherwise violate any applicable local, state, national or international law. 11. ANZAAG Only Access: The ANZAAG member will be able to access the site through their specific user name and password. Access to the ANZAAG member’s only section of the website by other persons using a member’s personal password is strictly prohibited. It is the responsibility of each member to protect the password and to not allow its use by any other person. It is the user's responsibility to always maintain the confidentiality of all information maintained within this section of the website. Contact details of ANZAAG members are not be distributed outside the group without the specific prior agreement of the ANZAAG member/s involved. All resources under development and draft documents in the ANZAAG only area will not be eligible for distribution outside ANZAAG, or for clinical use, until they are endorsed by the full membership of ANZAAG for this purpose. ANZAAG recognizes that divergent medical opinions may exist amongst its members and ANZAAG expressly takes no responisibitliy and accepts no liability for accuracy or validity of medical opinions expressed on the site, whether in the member’s only section or elsewhere. 12. Third party content: We are distributors (not publishers) of the content supplied by visitors and other third parties. Any options, advice, statements, services, offers or other information or content made available by members, visitors and other third parties are those of the respective author(s) and we are not responsible for any material posted by third parties. We cannot and do not endorse it in any way, nor do we vouch for its accuracy or usefulness. Furthermore, we expressly disclaim any liability associated with material posted by third parties. 13. Disclaimer of endorsement: Reference to any products, services, hypertext link to the third parties or other information by trade name, trademark, supplier or otherwise does not constitute or imply its endorsement, sponsorship or recommendation by us. Nor is an endorsement of us implied by such links. 14. Links to ANZAAG: You may link to this site, but permission is restricted to making a link without any alteration of the site’s contents. Permission is not granted to reproduce, frame or reformat the files, pages, images, information and materials from this site on any other site unless express written permission has been obtained from ANZAAG by contacting admin@anzaag.com. ANZAAG reserves the right to prevent linking by giving notice. 15. Information subject to change: Any information on this website may include technical inaccuracies or typographical errors. Furthermore, the information may change from time to time without any notice.